The View from Israel. : Israel finds old Arab enemies more reliable allies than the Dutch Government. Israel finds old Arab enemies more reliable allies than the Dutch Government. Why is the Dutch government practicing being so contrary against Israel in recent years? What? You mean protest Israel maintaining its presence in Judea & Samaria, particularly in what is called Area C and which they are legitimately allowed to control under the Oslo Accords? Recently, I arranged for Dutch pro-Israel activists to go visit one illegal village called Khan al-Ahmar. It’s illegal because the Palestinian Authority with the connivance of the EU and individual European governments led by the Dutch are illegally building homes and schools and illegally transferring Bedouin families from other areas under the PA in order to create false facts on the ground? Regavim, the Israeli NGO, show people what European countries and organizations are doing in the territories that are in serious breach of their Oslo commitments. This contrarian behavior has a lot to do with their Minister for Foreign Trade and Regional Development. Sigrid Kaag once served in UNWRA, the United Nations organization that has done more to condemn Palestinian Arabs to refugee status for seventy years, and in growing numbers, than any other organization on earth, and she is proud of it. What would you expect from a biased woman married to a Palestinian diplomat? 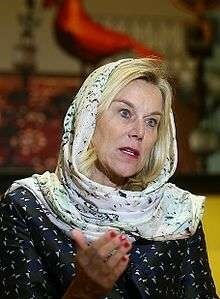 Kaag claimed in an interview that her father-in-law was stabbed by a Jew wearing a keffiya, and Arab head dress, a claim that was proven to be palpably untrue and smells strongly of being an anti-Semitic falsehood. This is the way they practice peace diplomacy in Holland. The Netherlands can play no impartial role with characters such as Sigrid Kaag playing a leading role in Dutch diplomatic life. While her anti-Israel stance was on full display, Egyptian President Abdel Fattah al-Sisi and Saudi Arabia’s Crown Prince Mohammed bin Salman met on November 26 and resolved to encourage Arab nations to establish economic relations with Israel, according to Arab sources close to the Jerusalem Post. It seems that Israel can rely on past Arab enemies to be more even handed toward the Jewish State than the diplomatic hierarchy in the Netherlands. Israel, and Indigenous Peoples Everywhere.